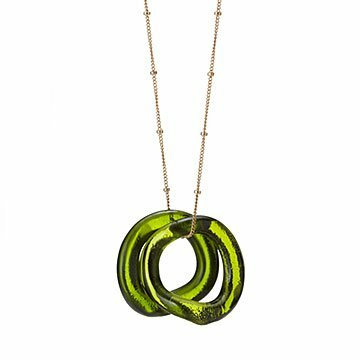 Crafted from reclaimed champagne bottles, this piece keeps the bubbly celebration going. When the champagne is finished and the party ends, why do those fizzy feelings of celebration have to stop? Kathleen Plate doesn't think they should, so she handcrafts this one-of-a-kind necklace from recycled bottles of effervescent. An elegant set of circular pendants, it's a reminder that the good times can always roll—if you let them. Perhaps their most charming characteristic: They clink softly to echo delightful party toasts and cheers. Send them to your favorite hostess or friend who keeps things bright and social all year long. Handmade in Georgia. Kathleen Plate's elegant and contemporary recycled glass jewelry has a bit of family history. Plate grew up in Washington and observed the art of cutting and soldering glass by her crafty mother. She still brings those skills to her pieces today. During the mid 1990s she began making and selling jewelry in her spare time. She did so well that she decided to take her Smart Glass work national, even though it meant putting off her graduate work in American Literature. Smart Glass pieces are all handmade from bright and bold stained glass, silver solder and sterling silver. Plate believes in simplicity and respect for the earth and the human spirit. All her designs use recycled material, while portions of the proceeds from others will go to support many of Kathleen's favorite non-profit organizations.